A cheaper entry into the silky smooth world of 144Hz gaming? We’re extremely grateful that monitor and TV manufacturers have turned their attention and marketing budgets towards 4K panels. It means we can move on from the days of 3D monitors. However, even if 3D monitors are a thing of the past, we’ve been left with some really useful display tech – and that’s been exemplified by the new Asus VG range of 144Hz monitors. The elevated refresh rate necessary to achieve stereoscopic 3D has lead to some amazing advances in modern gaming monitors. We’re now getting more accurate color reproduction than yesteryear’s TN panels, with faster response times, which will just be awesome for users that play fast paced games. However, it’s still the 144Hz refresh rate that gets us hyped about the scraps of the latest 3D movement. This means the TN panels with their fast refresh rates can get a bit expensive. IN fact, you can pick up a decent 27-inch 10-bit IPS display for about the same price as this Asus TN panel. So, it can be hard to figure out what’s right for you. Asus's VG range of 3D screens have all been solid performers, offering the full Nvidia 3D Vision 2 experience, with Lightboost tech to make the best of the stereoscopic 3D's numerous failings. Outside of the 3D modes they're great monitors, offering a smooth desktop experience with a top-of-the-range 144Hz refresh rate and that excellent new spin on TN technology. The Taiwanese company has also been smart in removing the built-in IR receiver and bundled 3D Vision goggles from the most recent screens, such as the VG278HE. Now you won't find yourself accidentally firing up Skyrim with a hunk of plastic strapped to your face, filling you head with blistering headaches. Luckily, it’s more affordable this time. It’s just a shame that this 24-inch version isn't all that cheaper than the 27-inch model. We were hoping the smaller size would represent a more budget-oriented entry into the glorious new 144Hz world, but you’re only saving about £60. That said you are still getting the same native resolution, full tilt/rotation, a VESA-compatible stand and great image quality, but a sub-£300 price-tag would have been nice. That's especially true given what BenQ has managed to do with its XL2411T. 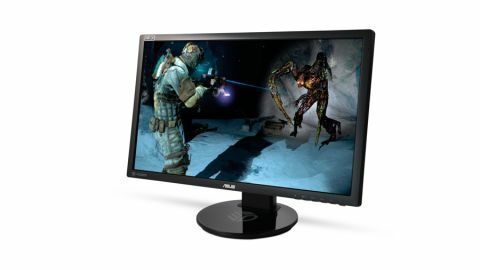 It's almost £100 cheaper than this 24-inch Asus screen, and the only real difference we can make out is that this panel is rated at 144Hz, as opposed to the 120Hz of the BenQ. Most users would agree that a decent 120-144Hz monitor is great for gaming, minus forking out for an Nvidia 3D Vision bundle. Sure, Asus has some impressive screen tech in its monitor lineup, but it needs to get a lot more competitive in terms of pricing, given the value on offer from both BenQ and Iiyama at the time of this writing.